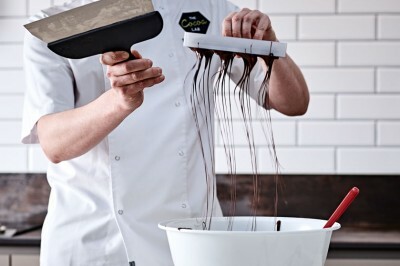 Join us for an afternoon of Easter chocolate making in our cookery school. We will teach you to temper chocolate, a skill that you can use time and time again, before we teach you and you will make delicious enrobed chocolates filled with miso salt caramel, a Chocolate Easter egg, chocolate truffles and white chocolate and pistachio bon bons. All your chocolate goodies will be wrapped ready for you to take home, either for unique and personal Easter gifts or for you to enjoy with your family. Take home with you all your chocolate treats made during the session and your Easter egg moulds so you can make more eggs at home if you wish.